Mesh: It's not just for the 80s anymore. This necklace has refashioned expectations and brings mesh into the modern day with dazzling Herkimer "diamond" quartz stones sparkling from inside its web. Its so trendy and irresistible, one outing with it just won't be enough. A portion of the stringing material on this necklace is purposely exposed to provide flexibility and strength, to allow the beads to move freely, and to let you coil the necklace for storage. 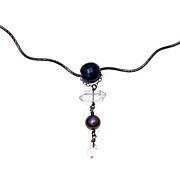 Stringing the piece too tightly could result in damage to the cording or the beads. Due to the composition and natural properties of mined gemstones, the product image may show slight differences to the actual stone in color saturation, tone, hue or other gemstone characteristics such as phenomena, color banding and color matrix. 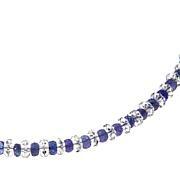 Gemstones and pearls are sometimes treated to enhance their natural beauty. To learn more and find out about care instructions see details. Love this necklace! Bought it in the sterling silver, and wow, does it sparkle! Hope to save up and get the matching bracelet next. Was surprised at how much I liked the piece. Was not sure I would like the netting. But it is smooth. So far it has not snagged on other jewelry.A keeper. I'm a big fan of Deb Guyot and I wish that she would go back to selling some of the items that she used to sell before just selling mainly herkimer. 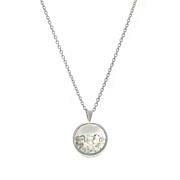 That said, this necklace is gorgeous! It is extremely sparkly, light and comfortable. I bought the silver, and would definitely go back and buy another to layer, I love the extender detail! I ordered the black and the Herks just shine through and really sparkle! 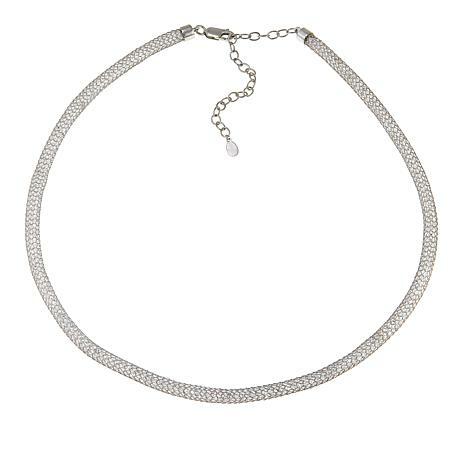 I have a 14k mesh necklace with diamonds and this necklace outshines the 14k!it is not stiff like some silver mesh,Love this! Flaunt your free spirit and take your style in a refreshing new direction. Effortlessly blending gorgeous gemstones, captivating colors and delicate details, Deb Guyot’s extraordinary creations perfectly unite nature and fashion. Slip on her substantial necklaces, bracelets, rings and earrings for an easy, put-together look with true feminine appeal. Remind me about Deb Guyot Designs upcoming shows.